I am a resident of Aurora Colorado. In late 2006, I was selling tickets to the Air Force Falcons football game at the USAFA in Colorado Springs, CO when I was arrested by the MP’s and charged with a DUI. I called attorney Charles Harper, and Mr. Harper immediately came to the USAFA Detention Facility and got me out of Jail, and then Mr. Harper drove me home. After that, Mr. Harper represented me at my State of Colorado DMV Hearing. Then Mr. Harper represented me in my DUI case in the EL Paso County Colorado Court in Colorado Springs. Mr. Harper took my DUI case to a Motions hearing and then to two court dates for a jury trial, but the DA was unable to proceed to a jury trial in my court case, and so my DUI case was completely dismissed. The skilled and experienced legal services provided to me by attorney Charles Harper completely exceeded my expectations and saved me from a criminal record. I will be forever grateful to Charles Harper for his legal services to me in Colorado Springs Colorado. Sometimes a person makes a mistake, one that would never be made under normal circumstances. However the legacy of such a moment of poor judgement can follow such a person, exerting negative influences and innuendo that directly affect the person’s entire future. I was such a person who made such a mistake at an early age and convicted of a misdemeanor. Subsequently, despite my extensive efforts to repent, I was turned down for jobs I was completely qualified for, forced into a nightmare of substandard jobs and passed by for promotions I deserved. Higher education became illusive. I had problems with my banks extending small loans and finally accepted that I would never again have the chance to excel to my level of competence. That is I ‘almost ‘ accepted that fact until I conferred with Charles Harper. Thru his sound advice, guidance and action on my behalf, my record of momentary stupidity was finally abolished. I have moved forward since that time, achieving modest success and happiness that was so elusive before. Thank you for your sage counsel. I called Harper Law Firm from an ad in the Frederick, Colorado yellow pages. I was recently charged with a violation of my DJ&S in a felony case in the Larimer County District Court. It was true that I had violated the terms of my DJ&S, and so I was thinking that my completely clean criminal record would now have a felony conviction on it because of this probation violation, even after everything else that I had done since 2001 in order to avoid this felony conviction going on my record. Thankfully I called attorney Charles Harper that day, because he took my case, and he somehow managed to persuade the Larimer County D.A. to give me one more chance to finish my DJ&S, and he even got the DA to give me some extra time to complete my DJ&S that I had already violated! Somehow I never got a felony conviction because of my probation violation, even though I violated my probation, and then somehow my felony criminal case got completely dismissed! We are now even about to file a petition to request the sealing of all records of this felony criminal case. And before I called Attorney Charles Harper, I thought I was about to be a convicted felon for the rest of my life. It is only because of Mr. Harper and the DA that I was spared this felony criminal conviction, and it is only because of Mr. Harper and the DA that I still have a chance to clean my record. I called Charles Harper from his ad in the Conifer Colorado telephone book. I had been arrested for a DUI in Park County Colorado. My driving record was clean before that. Mr. Harper set my case for a motions hearing and a jury trial. On the day of the Motions Hearing, I had almost forgot I had court that day, but thankfully Charles Harper called me to remind me that I had court that day, and then after we arrived at the courthouse in Fairplay, Colorado, the Park County Deputy Sheriff was very late in arriving at the courthouse for my Motions Hearing, and so the Judge dismissed my DUI case! I would have not even known how to begin to fight my DUI case without the assistance of my Attorney Charles Harper. Mr. Harper saved me a possible jail sentence, 1-2 years of probation, many alcohol education and therapy classes, many hours of community service, a VIP and a lot of money for fines and court costs. Everything about this DUI case was gone from my life forever on that one afternoon in court that I am sure both of us will never forget! Thanks again CEH. Since I was already a client of HLF, I retained the services of Charles Harper, Esq. to assist me with a new misdemeanor criminal case in Denver County Court. We went to court together several times for the case and then my case finally went to the court date for my jury trial. 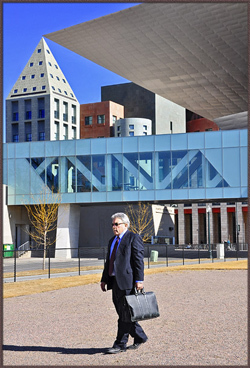 The Denver City Attorneys were all prepared for the jury trial, and Mr. Harper refused to let me take any guilty pleas, and then there was a standoff in court, and then finally the City Attorney ended up dismissing my case right before the jury trial. Now thanks to HLF, all of the records of that criminal case have already been sealed and it is now off of my record. Very nice work on both of my cases. I had 2 misdemeanor theft criminal cases filed against me in the Colorado Springs Municipal Court. I found out about HLF in a military newspaper in Colorado Springs. I hired Charles Harper to represent me in both of my court cases. Mr. Harper put my 2 court cases together on the same court date which was very helpful and convenient for my limited time, and then it took Mr. Harper several tries on several different court dates in the Colorado Springs Court to finally convince the prosecutors to give me a special DJ&S plea in both of my theft cases. The prosecutors were not willing to do this for me without a lot of special efforts on both of my cases by Mr. Harper and by me, but finally after much efforts and thanks to HLF, now both of my criminal theft cases have been dismissed. This result saved my career and my job and my marriage and my family and it basically about saved my life! HLF has represented me and my sister in many cases over the years, mainly in Weld County Courts. Mr. Harper and his very fine legal assistant both assisted me with my high conflict and very contested divorce case that involved 3 of my young children. HLF handled that divorce case with the best possible family law skills. Then Mr. Harper represented me in a misdemeanor criminal case, and then also in a P.R.O. case involving my own family members. Mr. Harper has also assisted my mother with her Will and other various Estate Planning matters for her, and then Mr. Harper has also assisted our family with the Estate and Probate when my mother passed away. HLF has been very close to the legal affairs of my family for over 15 years.